My colleagues Bob Jolly and Peter Orazem conducted a survey of Iowa State University Alumni a few years ago to gather data on the entrepreneurial activity of that group. Do graduates of a public university exhibit entrepreneurial behaviors over the course of their careers that are at all different from the population at large? What sort of businesses do they start? When do they start them? Do entrepreneur alum’s incomes differ from their non-entrepreneur counterparts? You can view an extensive summary of the results of this survey of 1982 to 2006 ISU graduates here, but the results showed that the education and experience received at Iowa State University had an impact on the entrepreneurship activity of graduates. While formal classes and programs on entrepreneurship were not offered at Iowa State University until the latter 1990s, it appears that something in the university experience and the subsequent career path of graduates leads to relatively high rates of entrepreneurship. It also appears to lead to higher rates of firm survival for alumni entrepreneurs than for entrepreneurs generally. While the state of Iowa has consistently lagged other states in various measures of entrepreneurial activity, Iowa State University graduates exhibit a higher rate of entrepreneurship compared to the population as a whole. Various studies show an entrepreneurship rate for Iowa’s population of around 5 to 6 percent. This compares to 15.8 percent found among 1982 to 2006 graduates in this survey. The implication is an entrepreneurship rate among Iowa State University graduates about twice that of the general population of the state. Entrepreneurship rates varied by college of graduation, with the highest rates among those who received a bachelors degree from the College of Agriculture and Life Sciences or the College of Design. 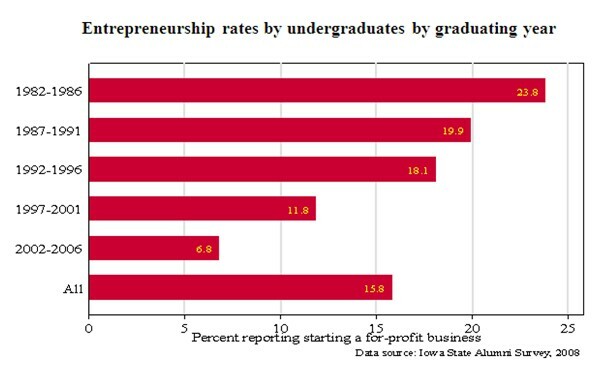 Iowa State University graduates also appear to exhibit higher entrepreneurship rates than other college graduates. One study (Farlie) found that U.S. college graduates had an average annual entrepreneurship rate between 1996 and 2008 of 0.296 percent, implying a 7.4 percent entrepreneurship rate over a twenty-five year period as with the alumni survey. Interestingly, Fairlie found U.S. college graduates to have a slightly lower annual entrepreneurship rate than the population as a whole, which had an average annual entrepreneurship rate of 0.305 percent over the 1996 to 2008 time period. Iowa State University graduates may have more comparable entrepreneurship rates with respect to other institutions of higher learning with a scientific and technical core, though there is not extensive data available on this topic. In one example, The Massachusetts Institute of Technology (MIT) surveyed all of its living alumni and found an entrepreneurship rate of 23.5 percent. Keep in mind that MIT has a very rich history of significant technology entrepreneurship, with alumni having created companies such as Hewlett Packard, Intel, and Digital Computer. Given that the entrepreneurship rate among the earliest cohorts in this survey was about 25 percent, we suspect that the rate for Iowa State University would have approached the MIT level if graduates pre-dating 1982 had been included as they were in the MIT study. In the next post, I’ll discuss the results of this survey related to job creation by ISU alumni entrepreneurs. Roberts, Edward B. and Charles Eesley. Entrepreneurial Impact: The Role of MIT. February 2009. MIT Sloan School of Management.